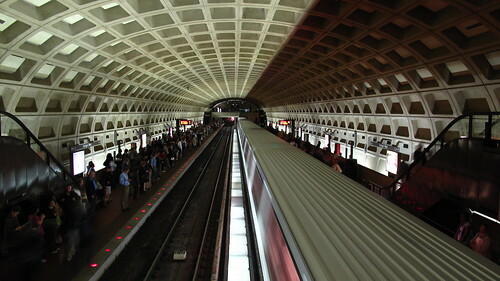 The Metro, in Washington D.C., is by all appearances a model urban transportation system. Its trains run smoothly, quietly, and quickly. Its stations are well designed, with excellent signage, a cool breeze, and even lights at the edge of the platform that blink when a train arrives. The metro has further appeal in its regional scale, converting from central business district circulator, to commuter rail system as it travels further from the urban core. By comparison the New York City subway is awful. Its trains jerk passengers about at starts and stops. Loud screeching echoes through stations as trains turn a curve or come to a stop. The stations are fluorescently lit and tiled, making their overall appearance like that of a public bathroom (a function which they have also been known to take). Worse yet, in is the summertime heat of the asphalt above seeps into the crowded stations. Also, unlike the Washington Metro, New York’s subway never takes on the speed, the comfort, or the role of a regional commuter rail system. According to the three central factors that should influence travel decisions, time, cost and comfort, Washington should have New York beat hands down. Its trains are fast, its rides generally cheaper (you can’t go one stop on the New York subway for less than $2.25), and its trains much more comfortable. Why is it, then, that just about everyone in New York takes the subway, yet the Metro captures only a fraction of Washington’s commuters? According to planners, it’s all about density; and New York’ got it in spades. There is much truth to this point, and the transportation-land use connection (which basically says that people use transit where dense nodes of development surround transit stations) is now a nearly universally accepted concept. But doesn’t the Washington Metro have a reputation for encouraging dense mixed use development around its stations (i.e. the Rosslyn-Ballston corridor)? And while New York is certainly dense, its policies don’t directly encourage Transit-Oriented Development (TOD). According to friends in Washington who are otherwise not inclined to own a car, the problem is “the Metro doesn’t go anywhere.” It’s true that there are large parts of Washington that are not well served by the Metro. But certainly the same can be said for New York, where the subway does not come close to extending to the city line, and avoids certain areas all together. As for the central business district, which is where it really counts, both cities’ cores are well served. There has to be something more to it; how is this contradiction explained? The answer came to me on a random day, running out for a meeting about a mile uptown. It was 9:45 am, the meeting was at 10, and I was very late. I left my building at 9:46, 30 seconds away from a subway stop. I descended a single flight of stairs, swiped my card, and just when I hit the platform a train was arriving. Three stops later I exited, up just one more flight, and arrived at my destination a few minutes after that. Arrival time: 9:53 – 8 minutes after I left my desk in a panic. That’s the kind of transit experience that makes you sell your car, or never hail a cab again—the kind of trip that the most successful transit systems are based on— because they show you any other way of getting there is plainly inferior. Then it occurred to me that a trip like that isn’t possible on the Washington Metro. To be sure, I don’t think there is an 8 minute door-to-door trip in the history of that system, or many others. While the metro shines over longer distances, and attracts a great deal of commuters as a result of it, despite having well-placed stations in its CBD, it simply can’t do 8 minute trips. Transit ridership is good for itself. Of course ridership is good and necessary for a system to exist at all. But, it’s not just that people using transit is good for the system, but that a sweet spot can be achieved where ridership begets more ridership. I call this the “transit tipping point.” It is the combination of factors which result in a pattern of increased transit ridership. The transit tipping point occurs when a system is so attractive by comparison to its alternatives that it gains widespread use and thereafter gains the momentum to improve itself. More people are riding, therefore more service is provided, therefore more stations attract diverse uses, and – in turn – more people are riding, and so on. The best transit systems in the world share in this great success, where everyone who lives anywhere near the train is taking it or buses run every few minutes and stations or stops are surrounded by dense, mixed-use centers. Moreover, if you think about the small handful of places in this country where living car-free is a realistic option, their transit systems enjoy this type of success, too. Originally, my purpose in exploring this subject was only to identify the factors that explain why some transit systems have failed to meet expectations, and others continue to succeed despite a lackluster experience. Only later, in further discussions of what “living urbanism” means, did the true motivation occur to me. Those who are fortunate enough to choose whether to own, or drive a car, enjoy a profound freedom that is as enjoyable as the best of public spaces, living in diverse communities, or any one of the goals to which new urbanists have dedicated themselves. Too often, though, transit has fallen short on its potential to improve our quality of life because it never reaches its tipping point – instead sliding in the opposite direction, disappointing its advocates, and fueling criticism. The point of this essay is to identify some ways in which that trend may be reversed. There are several well known factors that consistently lead to successful transit. Thus, before moving on to the subtleties that define the best systems, it is worthwhile to go through them. To be sure, all successful transit systems need to have these essentials in place. The most critical component in successful transit systems is density. (Otherwise known as the “Transportation – Land Use connection”). It’s the great built in advantage of the world’s best systems, and has even been given a fashionable name: “transit-oriented development.” (Which many of us in older cities think is a fancy description for an obvious idea). But it is not the density alone that is so powerful, it is the effect of the density on the transportation economics equation. Generally, people are willing to walk to and take transit within a pedestrian shed (5-minute walk) of where they reside. More detailed research indicates that (quite sensibly) the propensity to walk (and walk further) increases with the utility of the trip to be taken – i.e. you might walk 10 minutes to a commuter rail station, but only 5 minutes to a light-rail. The problem with these figures, is that they are using a single metric to correlate the results of the complex equation that is occurring. What other transportation options are available? Is there parking at the station? How much faster is the train than driving? How much more expensive? Every one of these variables is placed in the melting pot of transportation decisions. Density around stations should be a central goal in the planning of transit systems. To be sure, it is present in every successful one. But, do not believe that you can’t make transit something that people in detached single-family houses aren’t going to walk 15 minutes to. In wealthy suburbs, from Winnetka to White Plains, people leave BMW’s in the driveway every morning to walk 15 minutes to a train. The question is why? Planners have offered up density as their big answer to transit success – and I largely agree. But my choice for the number two spot, even more rarely implemented than density and TOD’s, is policies that make it more difficult (i.e. expensive) to drive. Said plainly, people who take transit every day do so because it’s cheaper than driving (in the sense of time, comfort, and/or direct costs). It follows that to discourage driving, by making it more expensive, would correspond with encouraging transit use. Every time gas or tolls become more expensive, someone takes the bus. If the bus route is changed to take five minutes longer, someone will opt to drive. These are the margins of transportation economics, and they are where the slightest changes have effect. It’s an especially important point in light of the number of transit systems that flounder in spite of massive subsidies. After all, they have new trains, new stations; why aren’t people riding? The answer is likely that no policies to discourage driving were adopted when transit was introduced. Note, I am not referring to policies that attract people to transit, such as tax-free fares or advertising. I am talking about making driving more expensive directly: tolls, congestion pricing, parking taxes, gas taxes, etc. Without these policies, it is nearly impossible to turn the auto-oriented masses into transit riders. The car is simply too good a deal as is. In case you doubt the positive impact expensive driving could have on transit, just take a look at the few thriving commuter rail systems left in this country. Generally, they serve affluent communities where everyone own cars and shun public transportation. But how else can we explain that people in these communities are not only walking to the train, but they are walking further than we would ever expect. What really got them out of their cars? Traffic. Tolls. Parking. Gas. It has everything to do with driving being unattractive. Using transit may prove faster a lot of the time and therefore be considered less costly than driving. In general, however, driving is almost always less expensive – in dollars and cents. There are two points to be made here: First, transit is far too expensive (by comparison to driving) most of the time.. This has a great deal to do with making driving comparatively more expensive of course, as discussed in the earlier section. The second problem related to the cost of transit is the related cost of auto ownership. Unlike transit, where most of the travel costs are paid on a per trip basis, the automobile has the great advantage of sticking you with the costs up front, and making it a better deal to drive your car later. Given the large investment that is buying a car, in addition to mandated insurance and necessary repairs, it is estimated that car ownership costs Americans about $8,000 a year. So, when the cost of driving is being compared to using transit; well, you’ve already paid for most of the drive, so you’d better get your money’s worth. The point is that the deck is stacked in favor of cars, before even discussing things like highway spending and subsidies for auto-makers. At the most basic level driving is, at present, a much less costly way to get around. Unless that equation can be altered, transit will not succeed. Now on to the hidden factors which allow a system to achieve the transit tipping point. On review you will find that the consistent theme in all of these factors is that they capture short, spur of the moment trips. This is because in the same way some transit systems are successful in replacing the drive to work, they need to replace taking the kids to school, running to the store, etc. This strategy is contrary to much of transportation planning, which aims to get people to commute long-haul distances using transit. Not to downplay the importance of the commuter trips, but they only make up a fraction of the total. And, more importantly, it is the shorter unplanned transit rides that are at the heart of the transit tipping point – which will eventually lead to increased transit use by everyone from commuters to tourists. Plus, if the challenge is convincing new riders to try transit, it’s a lot easier to convince someone to take the train or bus for a one time trip than to alter their entire live-work arrangement. Headways – how frequently transit runs – are an under-appreciated part of the transit experience. 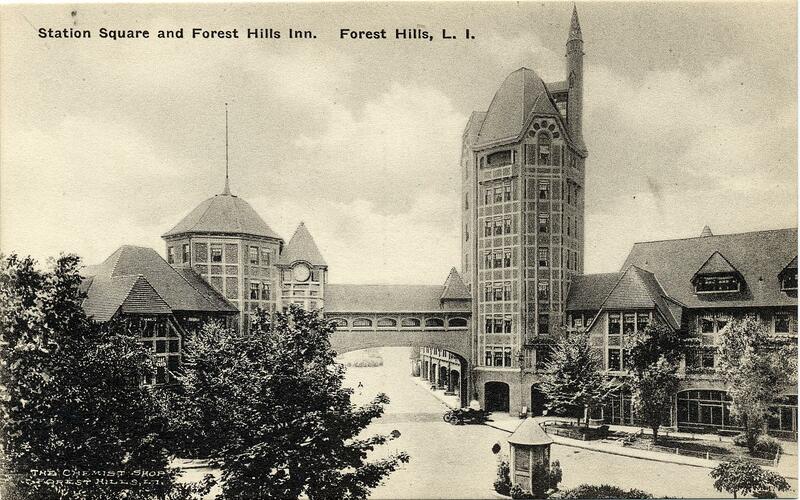 Imagine you arrive at a friend’s house to find they live right across from a train station. Trains run every 20 minutes, home run. Trains run twice a day, worthless. Granted those are the extremes; if you insert headways into the transportation economics equation, they have a serious effect. When you consider them in terms of the goal of hitting the transit tipping point, they make a world of difference. Transit options tend to fall within one of two categories: systems where you look at a schedule, and systems where you don’t (i.e. subway, vs. commuter rail). My general rule is that if service runs less than once every 15 minutes, I check a schedule. . The critical difference between these two types of systems is the extent to which they can influence spur of the moment travel decisions – that is, those that are happening at the margins. There is a minimal cost involved in checking a schedule, but it is something you must do before you leave. For instance, if you are scrambling to get to a meeting you need to have checked the schedule before declining a taxi in favor of the train. There are likely many such spur of the moment trips that might go to transit, but instead end up in the automobile. For this reason the transportation systems at the heart of a transit tipping point are more likely to be non-scheduled systems, for the simple reason that they capture spontaneous trips. But, that’s not the end of the story. The problem in this case is that because users aren’t checking a schedule, the duration of their trip is inextricably linked to the average wait time for service. Said otherwise, if the train runs every 14 minutes you probably won’t check a schedule, and you will also probably wait 7 minutes for a train. The effect of this average wait time cannot be overstated. It is a deal breaker for certain systems, and what makes others work. To compare, take the train running every 14 minutes versus that running every 4 minutes. The average wait times of the systems will be 7 and 2 minutes respectively. In the case of rides lasting 30 or 40 minutes (which the planners are typically keyed in on), it has a minimal impact. But in the case of shorter rides, it has a much greater proportional effect which makes them worth taking or not. Furthermore, there is a psychological effect at play; it feels good to get going, even sometimes when it will take longer to get there. There is hardly anything as sweet as when the train arrives just when you get to the station, and almost nothing worse than just missing one. Shorter headways trend towards more transit use, on every level. You’ll almost never hear about how long it takes to get from the street to the platform when people are telling you how long a transit trip is going to take. But given the difference between systems, it’s very significant. For example, catching a bus at the curb takes (in theory) no time at all, while arriving at a central urban rail terminal, on the other hand, generally takes several minutes to descend to track level. (The disparity is also clear in the comparison offered in the introduction [between the NYC subway and DC Metro] where the difference in travel time to the street varies from 30 second to 4 minutes). Making matters worse, this secondary trip occurs at either end of a trip, doubling its effect. Again, in the context of systems designed to attract longer trips (30, 40 minutes), it hardly matters. But in the case of shorter trips, such as those in the urban core where the system is intended to act as a circulator, the issue cripples the system – such as with the DC metro. As in the prior discussion about headways, the pure economics of the situation greatly favor easily accessible transit. And the shorter the trip, the more magnified the effect. Here, though, psychology plays a role because time spent seemingly at your destination, but minutes from the street, can drive you mad. For example, if you know your train is leaving the station, but you can’t navigate your way to the platform in time, you are left with stinging disappointment. The opposite is true at your destination – just think of how you feel waiting to get off an airplane when you are about to miss your connecting flight. Therefore, it is critical that transit systems incorporate into their design the ease with which users can reach the system from the street; or where different modes of transit come together, that transfers be made seamless by design. One the of the unique features of the New York City Subway, to which a great deal of its early success is attributed, is its flat fare (which was originally ten cents). This feature, which remains in place to this day (now two dollars and twenty-five cents), puts the system in the minority. Most transit systems today charge a variable fare based upon how far you are traveling. There is a sense of fairness in asking those traveling further to pay a higher fare, and in the case of long distance travel options like heavy rail or air travel, it’s a necessity. But in the case of transit, the flat fare holds a great deal of allure in its many benefits: 1) to simplify the experience of travel; 2) to use shorter trips within the central business district to subsidize longer trip to and from; 3) to favor less desirable places, in effect creating a progressive tax on travel. While the flat fare may actually make shorter trips disproportionately expensive, it eliminates any confusion as to fares because it is always the same. The weighing of costs can be done instantly, rather than having to look up how much it costs for a ticket from A to B. Moreover it completely simplifies the system of purchasing and collecting fares. These benefits, though marginalized by the introduction of electronic metrocards and the like, are significant. The greatest benefit of the flat fare system is that it uses the proceeds of shorter trips within the CBD to subsidize trips to and from it. For example, in New York thousands of tourists each year use the subway to go from Central Park to Times Square. They pay the same price, per ride, as people commuting to and from the outer neighborhoods. Finally, a flat fare serves as a progressive tax on locating near the CBD. Under a typical fare system, where further means more expensive, the cost of living far from the city center is twofold; not only is the ticket more expensive, but it costs more in travel time. Given that places with higher transit accessibility are (at least in theory) more desirable places to live, those less fortunate frequently live at the final stop or beyond. Though the flat fare can’t make their commute any shorter, it can certainly level the playing field in direct cost. In fact, the history of New York’s subway proves that the flat fare served as a catalyst for transit oriented development at new further-out stops as the system developed. This is because just as one more exit on the freeway is the mental justification for the sprawling exurb, just one more stop on the subway (no additional cost) was the justification for continuous corridors of TOD. I struggled to find a case study appropriate for this essay because most systems thrive or fail based largely on the well-known factors — namely density. That is until the recent CNU Congress in Denver, where the free buses running along the 16th Street Mall were not only the talk of the event, but the primary mode of travel for most attendees. To be sure, judging by the seemingly universal ridership, and their omniscient presence downtown, the buses are nothing short of a success story. What is more, they possess all of the “hidden factors” to achieving the transit tipping point; which, judging by the effect on their City’s CBD they have achieved (and then some). To dismiss the well-known factors quickly: Denver’s CBD is relatively dense, but it’s no Manhattan. Buildings along the 16th Street Mall are generally 5-10 stories in height. Though the skyline does have some taller buildings, there are many denser city centers in America. As for the relative costs of driving and transit, my informal observations were these: Driving looked to be exceedingly inexpensive in downtown Denver as there was little traffic, but parking costs were high. With respect to transit costs, the 16th Street buses are free – you can’t beat that. The hidden factors area really where the 16th Street Mall buses shine, though. Not only does this systems possess these characteristics, but to the fullest extent. Time – The buses run on a headway of somewhere between 90 and 120 seconds. This means that schedules are unnecessary, and the average wait time attached to any spur of the moment trip is negligible. More importantly, though, is the psychological sense that you never wait. Standing on 16th Street, the next bus is always in view. In fact, the buses run so frequently that you can’t even really feel as though you’ve missed one. Access – Of course with a bus system, there is great advantage with respect to accessibility; it leaves you right at the curb. But the reality of this system is more telling. First, it is important to note that while many systems are very accessible, but far from the action (i.e. the Las Vegas Monorail), the 16th Street Mall is the central spine of activity in downtown Denver. Therefore, this transit system really does drop you “right there,” so to speak. This couldn’t have been more obvious than when I hopped off to get off the bus to buy a drink from a sidewalk vendor, and by the time I had paid him, just got back on the next bus. Flat Fare – Ok, the 16th Street Mall are free. But there’s more to say. No ticket machines, ticket booths, stopping the bus so the driver can inspect tickets and collect fares. The fact that the buses are free leads to increased ridership not only because it’s cheap, but also because you just don’t have to think about it. It’s painfully obvious that they capture every spur of the moment trip. While our pursuit of a transit-friendly future has been focused on broader well-known issues in transportation planning, whether or not you drive or take transit is fundamentally a basic decision. With this insight, it is possible to create circumstances where transit ridership is engendered, and will create more of the same – the transit tipping point. While the ongoing debate is focused on TOD and modern streetcars, don’t forget the devil is in the details. And most people don’t “prefer” anything other than getting there faster, cheaper and more comfortably. If you can make those goals a reality, ridership will follow. I recently compared the two options, and for a basic 30 mile trip, the difference was roughly 4:1 in driving’s favor; that’s two roundtrip commuter rail tickets at $29, versus a little less than two gallons of gas at about $5. Ian Rasmussen is an attorney living in Forest Hills Gardens, New York. His practice focuses on land use, zoning and the legalization of good urbanism.